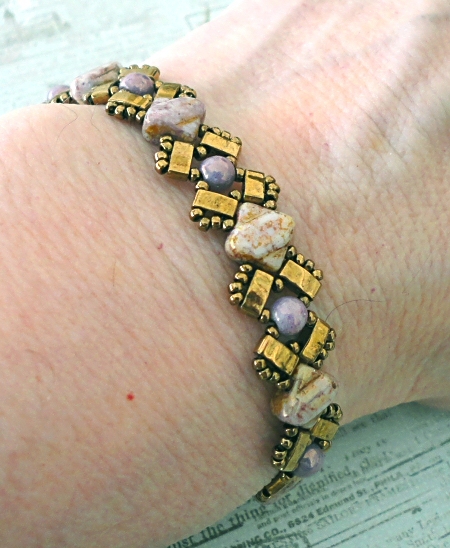 This is another wonderful bracelet creation by my friend Teejay. She sent me one for Christmas and I blogged about it HERE. 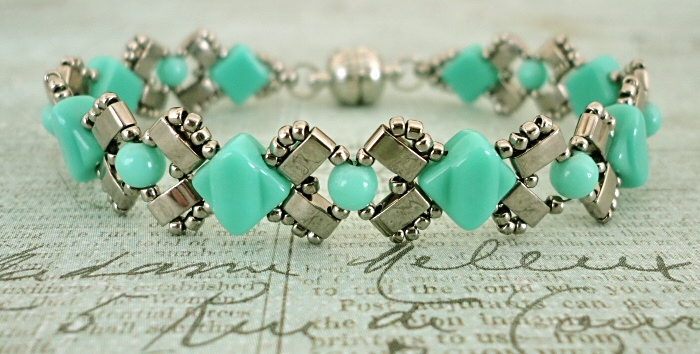 We decided to collaborate on a free pattern so that everyone can make some of these cute bracelets. It's not easy to find nice patterns for Half Tila beads so I'm glad that Teejay dreamed up this one. 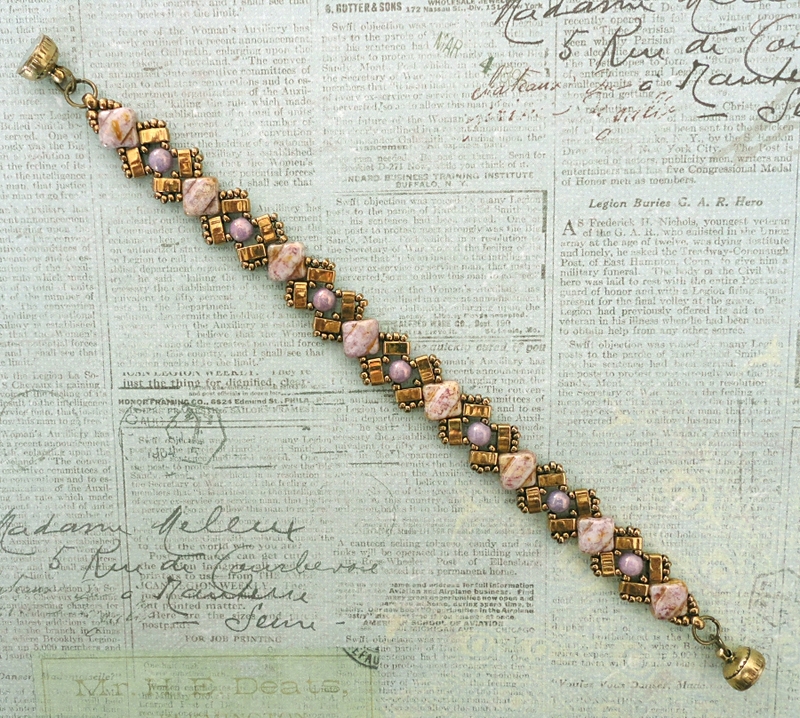 I've got eleven more Lucy bracelets to blog about over the next couple of weeks and it's hard to choose my favorites. I hope that you'll like them and be inspired to make some for yourself. 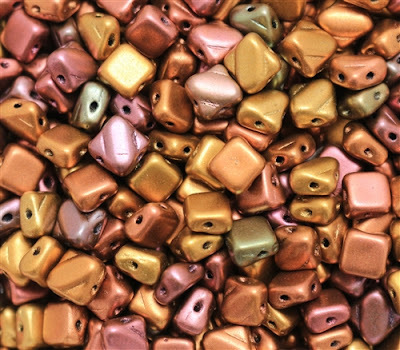 If you're looking for a great source for Half Tila beads, Red Panda now has all 107 of the colors that they come in. Click HERE to go directly to the Half Tila page at Red Panda. 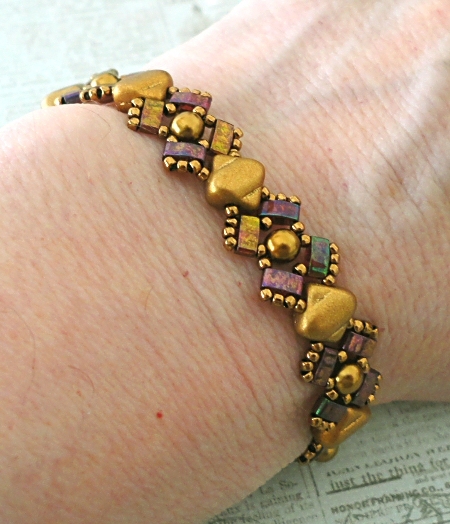 Some of the beads that I used in the bracelet in the photo above might be a little hard to come by. 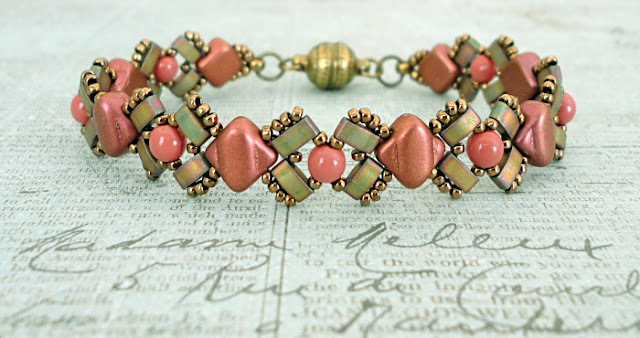 I found the light cranberry druks in a local bead shop and haven't seen that color anywhere online. The matching Silky beads aren't that difficult to find but they are from a color mix so it might be tricky to get enough of that color to make a bracelet from one batch of beads. 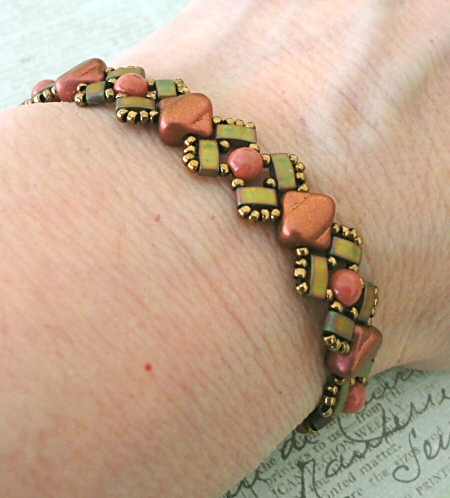 I just happened to get enough rose colored ones in my batch of 40 Silkies to make a bracelet in my size. I really wish that the bead manufacturers would sell some of the pretty colors that come in the bead mixes as separate colors. NOTE: I don't mind if you sell the projects that you make with our patterns, but please mention that you got the pattern from Linda's Crafty Inspirations. 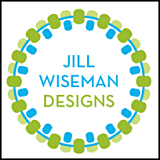 Please contact me for information about teaching this or any of our patterns in a class. 4mm druks "Chalk White Vega Luster"
Silky beads "Opaque Green Turquoise"
As you can see, "Lucy" also looks well in bolder colors. Although they're a little pricey, I love the nickel plated Half Tilas. They go perfectly with Toho's #711 silver beads and obviously they'll also go with Miyuki's nickel plated (#190) seed beads. I don't have the Miyuki nickel seed beads in all three sizes so I used Toho beads. Silky beads "Antique Matte Gold"
4mm Czech pearls "Antique Gold"
This bold color combination is very different from the colors that I usually work with but I like it very much. 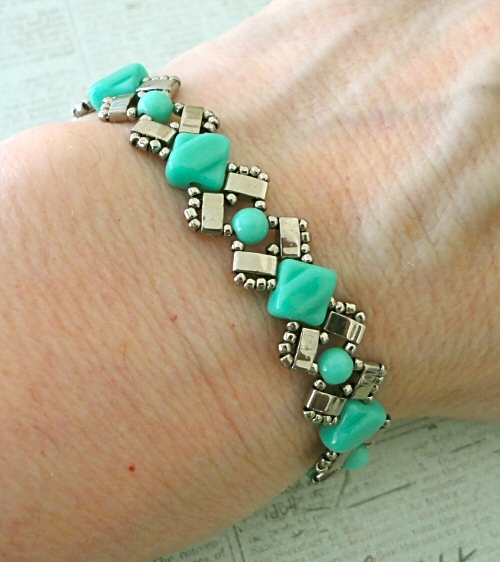 I checked my closet and I've got a couple of things that might go well with this bracelet. I actually picked out the gold Silkies from the same Crystal Violet Rainbow mix that I used for the rose bracelet but they're the same color as the Antique Matte Gold Silkies, which I also have. I thought I might as well use up some of the leftover colors. OMGoodness...so so cute. I love the colours in the first one. So pretty for the summer. Thank you so much for the pattern and the info. A very nice pattern and so loverly in all colours. Thank you for that great pattern. It's a wonderful pattern! TJ-you have such interesting ideas! 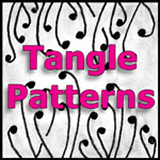 Many thanks to you and Teejay for sharing this lovely pattern! Can this be made substituting the 15 seed beads for 11 seed beads? I cannot work with the 15 ones any longer; age, eyes, arthritis hands. Hi Jojo. Sorry for taking so long to reply to your question but I wanted to try it before replying. 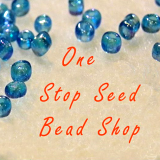 Yes, you can use 11/0 seed beads instead of the 15/0. It actually looks very nice too. Whenever the pattern says to pick up three 15/0 beads, pick up two 11/0 instead. I also changed the clasp loop to three 11/0 + one 8/0 + three 11/0. The little sample that I just made came out so cute that I think I'll make a bracelet like that. 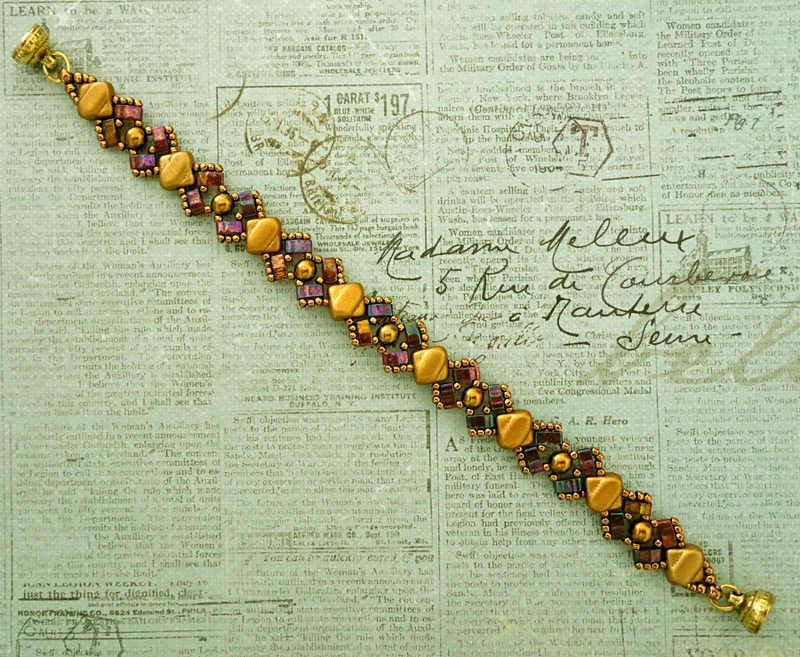 If I do, I'll post it on my blog and mention using 11/0 beads as a variation. Thanks for the idea! 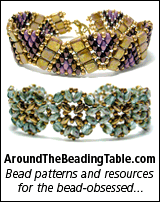 Do you use tiger tail, thread, or what for the beading? I use nylon beading thread. I mostly use Nymo D, Nymo B or 6lb FireLine. I am considering teaching this. I work at a Senior Center and have small classes of older adults who have fallen in love with beading! What are your conditions for teaching this pattern? Hi Barbara. Send me an email using the form on the right and we can discuss it. Vos creations sont vraiment de toute beauté. Une pure merveille. Bravo. Right-click on the link above and choose "Save Link As". A dialog box will pop up asking where you'd like to save the file on your computer. 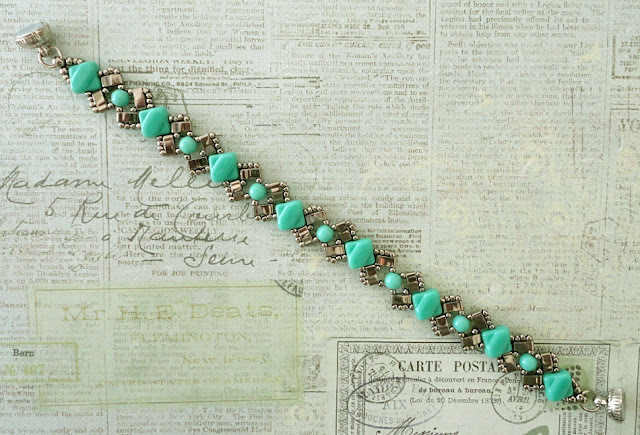 I love the bracelet, but can I substitute 4mm rounds for the Druks? Hi Debbie. 4mm rounds are the same as druks. You could also use 4mm pearls. I love the silky beads but am having a hard time finding them in the colors you feature here. Can you publish a source? Hi. Have you checked my Where to buy... list on the right side. 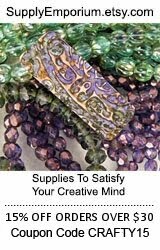 You will find a link to a list of sites that sell Silky beads there. It has been three years since I wrote this post so some colors might no longer be available. Is there a particular color(s) that you would like? I might be able to track them down.